Lets stop Skip stop also on the Nynäshamn commuter line! SL gets rid of Skip-stop - north of Stockholm. But we who live in Trångsund, Skogås, Jordbro and Krigslida has to continue standing on the platforms in the cold while the X trains swisches by! Other lines has 8 trains/hour while the Nynäshamn line has only 6 trains/hour. Despite this every third train skips over Trångsund, Skogås and Jordbro - and gives them even worse frequency of trains with only 4 trains/hour! Our skip-stopped stations are large and continues to grow. 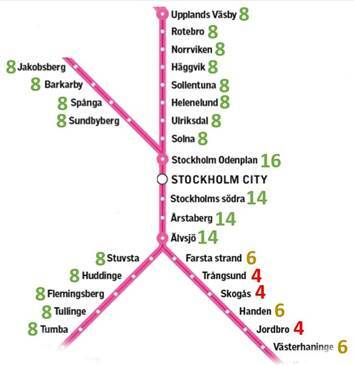 They have about as many commuters as the stations in Solna and Sollentuna where skip stop is now abandoned. Are we who live in Skogås/Trångsund/Jordbro/Krigslida worth less? SIGN NOW TO ABOLISH SKIP-STOP ALSO ON THE NYNÄSHAMN LINE! Our goal is to reach at least 4500 signatures - share, share, share! By signing, I authorize The network "Nej till Skipstop på Nynäslinjen" to hand over my signature to those who have power on this issue.